Microsoft is about to finish work on its newest Windows 8 this summer and is planning to have the first Windows 8-based tablets and PCs hit the shelves in October 2012, according to sources speaking for Bloomberg. With the October launch, Microsoft is aiming to lure Christmas Holiday season buyers. There will be both ARM and Intel-based solutions, just as promised, but initially Intel machines will dominate as there will be more than 40 systems running on Intel architectures and less than 5 running on ARM. Microsoft has made sure to tightly control the ARM-based devices to ensure matching quality. That’s why at launch we’ll see only three Windows 8 ARM-based tablets. 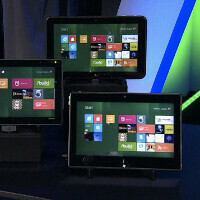 The timing to get Windows 8 tablets to the market could be a critical factor for the new platform’s success. If Microsoft fails to offer good enough competition to the surging iPad, Apple’s product could again dominate Christmas shopping lists and leave Microsoft’s products with a marginal share. Microsoft is planning an official event where it will unveil its plans and timing for Windows 8 sometime in April. The biggest hurdle in getting things to market in timely manner is making Windows 8 run on ARM. But the effort should be worth it, don’t you think? In time for the holidays... might just be my number one wish list item. windows 8 will be a great success with intel processors but with ARM it will be doubtful. With Nokia planning for ARM based tablet it will be a test for nokia. with both dell and lenevo out for windows 8 tablet. It is my wish for christmas . If the Microsoft OEMs make an Intel CPU chipset windows 8 tablet with good battery life than lookout baby it will be the most useful tablet on the market because the intel CPU chipset Windows 8 tablets can run full PC Games, Entertainment. and BUsiness programs buy one with a blue tooth keyboard and mouse and you do serous stuff with a windows 8 tablet. The Apple Ipad may still be the favorite for Entertainment Videos but the windows 8 Tablets will be the work horse tablets for more serious tasks. Windows 8 will indeed changed everything. Time by time tablets will catch up with pc. Then one day you could play games like Crysis on your tablets. Softwares like Adobe photoshop, 3Dmax, Microsoft Office will be on your tablet. It is by then you will see true Post-PC Era. If keyboard is a problem, Asus will no doubt release a Windows 8 with keyboard combo (Asus Transformer Prime). Haha. Heck yeah! I'm ready to be a W8 sheep. Windows 8 on ARM is cool, but a W8 tablet without the full desktop experience isn't worth switching from Android. I'd rather have an x86 slate closer to 1.5 lbs and 7-8 hrs of battery life. That'd be the sweet spot for me... I'm going to buy one in October regardless, but I hope they're able to get the specs somewhere close to that.